In this declaration, we see the seeds of what was to become the United States we know today. At this time, Sikhs were also claiming their autonomy in the northwestern portion of the Indian subcontinent at this time that would eventually bring them to American shores in pursuit of the same unalienable Rights. After the fall of the Mughal empire in the early 18th century that left the subcontinent in disarray, the various sections of the Sikh army (called Misls) controlled much of what is now northwest India and Pakistan. At the turn of the 19th century, the Sikh king, Maharaja Ranjit Singh, conglomerated many of these states to create the Kingdom of Lahore, stretching from what is now Afghanistan, Kashmir, Tibet and much of Indian Punjab. However, by the late 19th century, this Sikh kingdom would fall to the hands of the British who colonized much of the Indian subcontinent by this time. Sikhs would never see their independence again to this day, but, in the early 20th century, the first Sikhs and other Indians would arrive to the now-independent United States of America to seek work and education. They also came to remotely launch a revolution of their own for many of the self-evident truths that inspired the American colonizers to proclaim their independence from the same British rulers over a century earlier. For the purpose of remotely promoting revolution in India against British rule, the Ghadar (“revolution”) Party was created in the United States by the early settlers from India. 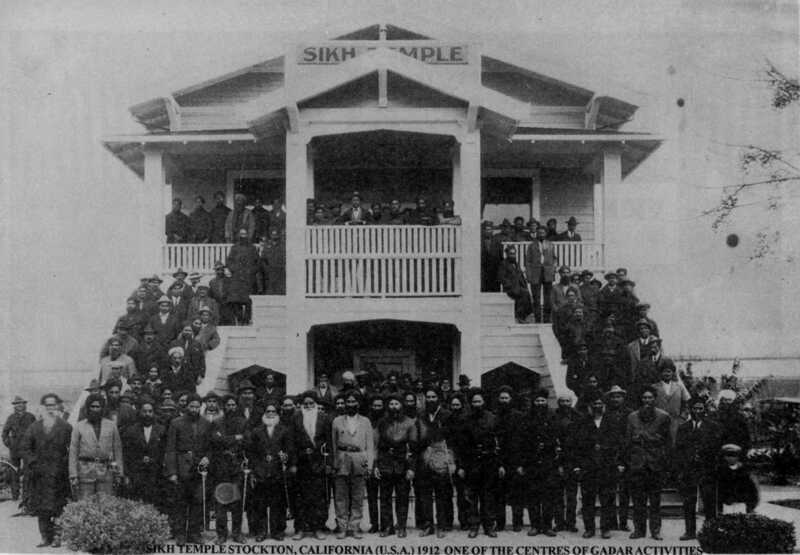 The Ghadar Party was headquartered in Stockton, California at a Gurdwara built in 1912 that would be the first Sikh house of worship in the United States. This Gurdwara still stands today and will be celebrating its 100th anniversary this year. It is not only a symbolic milestone of the emergence of the Sikh American community in the United States but it also symbolizes of a history of religious freedom in this country. American and Sikh values have much in common, and Sikh Americans can legitimately claim their strands in the American fabric. Independence Day is a good occasion to remind ourselves of this fact. ← Turban fashion or faux pas? LOVE this post. My MA thesis topic was the political perceptions of the hindustani ghadar party– and how their ideals, largely borrowed from the titans of american independence was molded to fit the ideas of indian independence from britain. How interesting! I would be happy to find out more about your thesis if you were open to sharing. I will send you some info if you would like.. your email? You can write to me at americanturban-at-gmail-dot-com. Sat Sri Akal. I am Sikh and must inform you that on the surface much of america and sikhi seem to be the same. But it’s all superficial. Except for the words, there is total difference in deed. What lies beneath the glittering surface of american values is a very evil system. I strongly advise you to watch this video to see what is really going on. It’s on the american government but basically, the american culture has a lot in common with the american government’s way of thinking. In fact after watching this video, if you don’t think we should be siding with the various other people mentioned in this film then you don’t really understand Sikhism. Satnaam, waheguru.